NextShares exchange-traded managed funds are a new way to invest in actively managed strategies. Because they are actively managed, NextShares offer the potential for benchmarkbeating returns by applying their manager’s proprietary investment research. And because they trade on an exchange, NextShares may offer cost and tax efficiencies that can enhance shareholder returns. NextShares can invest in all the same asset classes and employ the same strategies as mutual funds. NextShares funds may include equity, income, alternative and multi-asset funds managed in a wide range of active styles. NextShares may replicate the strategies of their managers’ mutual funds or employ strategies offered exclusively as NextShares. Different from most ETFs, NextShares are actively managed and seek to exceed the returns of their performance benchmarks and peer funds. NextShares are designed for long-term investors who seek active portfolio management with structural cost and tax efficiencies. As discussed in the pages that follow, NextShares, mutual funds and ETFs are purchased and sold differently and have varying costs. These and other distinctions may result in significant differences in investor returns. How do the costs of NextShares compare? Compared to a mutual fund with the same strategy and portfolio management, a NextShares fund can offer cost advantages that can translate into improved fund performance. Unlike many mutual funds, NextShares offer investors a single share class with no embedded distribution and service fees. Because NextShares are exchangetraded, their transfer agency expenses – the costs of administering shareholder accounts – are lower than for most mutual funds. NextShares can keep the trading costs associated with shareholder inflows and outflows low. NextShares generally don’t need to hold a significant reserve of cash to accommodate shareholder withdrawals. That means more of an investor’s money can be put to work in pursuit of returns. What is a fund’s total expense ratio (TER)? A fund’s total annual expenses expressed as a percentage of the fund’s average net assets for the year, as stated in its prospectus. Fund TERs include management fees, 12b-1 fees, custody charges, transfer agency fees and other operating expenses of the fund. TERs do not include flow-related trading costs or cash drag. TERs also do not reflect fund sales charges or other costs borne by buyers and sellers of shares. Compared to mutual funds that can be purchased and sold at net asset value, NextShares and ETFs may be more expensive to buy and sell. NextShares, mutual funds and ETFs are subject to different fund costs that impact investor returns. What are distribution and service (12b-1) fees? Fund payments to support the distribution of fund shares and the provision of shareholder services under Rule 12b-1 of the Investment Company Act of 1940. A fund’s 12b-1 fees are typically paid to the fund’s distributor and generally pass through to intermediaries that sell fund shares. Permitted 12b-1 fees are limited to one percent of average fund net assets annually. Mutual funds are often subject to 12b-1 fees that vary by share class. NextShares, and most ETFs, do not pay 12b-1 fees. A fund’s 12b-1 fees are disclosed in its prospectus and included in its total expense ratio. What are transfer agency expenses? The fees paid by a fund to its transfer agent and other intermediaries to process shareholder transactions and maintain shareholder accounts. Transfer agency costs are normally the largest component of mutual fund expenses other than management fees and 12b-1 fees. NextShares and ETFs typically have minimal transfer agency expenses. Transfer agency fees are characterized as "other expenses" in a fund's prospectus and are included in its total expense ratio. What are flow-related trading costs? The trading costs a fund incurs to purchase and sell investments in connection with shareholder inflows and outflows, including commissions, bid-ask spread (i.e., the difference between the best offer price to sell a security and the best bid price to buy a security) and market impact (i.e., the effect of a purchase or sale of a security on its trading price) costs. Flow-related trading costs are not disclosed in a fund's prospectus or reflected in its total expense ratio. NextShares keep flow-related trading costs low by issuing and redeeming shares primarily in kind (using securities and other noncash payments) and by charging transaction fees to "Authorized Participants" (professional investors who transact directly with the fund). Most mutual funds do not issue or redeem shares in kind or charge transaction fees. The impact on fund performance of holding cash. Cash drag hurts fund performance when the returns of the fund’s noncash investments exceed cash returns, and helps fund performance when the opposite is true. Cash drag is not disclosed in a fund's prospectus or reflected in its total expense ratio. NextShares that transact with Authorized Participants primarily in kind may experience less cash drag than mutual funds, which often need to hold cash to meet shareholder redemptions. How can NextShares potentially reduce capital gains distributions? Mutual fund investors can get hit with big tax bills, whether or not their funds increase in value. NextShares work differently. When NextShares investors sell their shares, they don’t normally transact with the fund; instead, they trade through a broker to sell their shares to someone else. Buyers may include other longterm investors or professional traders acting as market makers in the fund’s shares. Because the NextShares fund itself is not involved in these transactions, the fund isn’t required to sell securities to raise cash – so no capital gains distributions are triggered for remaining fund shareholders. When market makers and other large investors accumulate sufficient shares of a NextShares fund, they can redeem their shares from the fund by transacting through intermediaries called Authorized Participants. Here, too, NextShares work differently than mutual funds. Like ETFs, most NextShares funds meet redemptions through Authorized Participants primarily in kind,2 meaning that the fund distributes current portfolio holdings of securities rather than cash. By avoiding the sale of securities to meet redemptions, NextShares can potentially reduce fund capital gains distributions and associated shareholder taxes. The enhanced tax efficiency that NextShares may provide can be a meaningful source of improved investor outcomes. Tax efficiency can have a meaningful impact on investor returns. How do I buy and sell NextShares? There is nothing complicated about investing in NextShares. Receive a confirmation at the close of the day indicating your trading activity. NextShares list and trade on Nasdaq and are priced at the fund’s next end-of-day net asset value (NAV), plus or minus a trading cost determined when the trade executes.6 Trading costs are fully transparent and can be controlled using limit orders. Transactions in NextShares may be subject to selling commissions and other trading costs. As a new type of fund, NextShares may be offered initially by a limited number of brokers. Investor trading costs are the costs you pay to buy and sell a fund. These include the commissions, sales charges and other fees in connection with the transaction, and the difference between the executed trade price and the corresponding fund value (the amount of the premium/discount) when the trade is priced. Because all NextShares trading prices are directly linked to NAV, buyers and sellers of NextShares always know exactly what they pay in trading costs. By contrast, ETF investors typically cannot measure their trading costs because they don’t have access to a reliable measure of underlying fund value at the time of trade execution. Buyers and sellers of NextShares know exactly what they pay in trading costs when they execute their order. Mutual funds typically incur ongoing trading costs in connection with shareholder inflows and outflows – costs that are paid by all the fund’s shareholders, not just those who transact in a given period. By contrast, NextShares investors pay only their own trading costs, which are reflected in the premium or discount to NAV. If you’re a long-term shareholder of a NextShares fund, you won’t pay for the trading costs of other investors who may move in and out of the fund more frequently. In this way, NextShares are similar to ETFs. ETF investors also transact at prices that typically reflect trading costs. But, unlike NextShares, ETF investor trading costs are not explicitly disclosed and cannot be controlled using limit orders. By contrast, the trading costs paid by buyers and sellers of NextShares are always fully transparent. 1 A fund’s investment strategy and portfolio turnover rate are other important determinants of the frequency and amount of its capital gains distributions. Fund distributions of net short-term capital gains are generally taxable as ordinary income; distributions of net gains from investments held by the fund for more than one year are generally taxable at long-term capital gains rates. The tax character of fund distributions is determined and provided to shareholders after the end of each calendar year. In addition to capital gains distributions, fund distributions may include nonqualified ordinary dividends (taxed at ordinary income tax rates), qualified dividends (taxed at rates applicable to long-term capital gains if holding period and other requirements are met), exempt-interest dividends (not subject to regular federal income tax) and nondividend, or return of capital, distributions, which are not subject to current tax. 2 A NextShares fund’s redemptions may be effected partially or entirely in cash when in-kind delivery is not practicable or deemed not in the best interests of fund shareholders. 3 As of March 31, 2016. Based on the mutual funds included in the Lipper large-cap, multicap, midcap and small-cap domestic equity categories and using the highest individual federal income tax rates in effect each year. 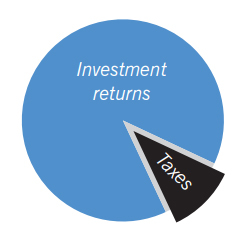 Actual after-tax returns depend on a shareholder’s tax situation and may differ from those shown. After-tax returns are not relevant for shareholders who are not subject to tax or hold fund shares in tax-deferred accounts. 4 Source: Morningstar, Inc. Includes all domestic, international and global U.S.-registered equity mutual funds tracked by Morningstar. 5 Not all broker-dealers offering NextShares may accept dollar-based orders. In share-based orders, you specify the number of fund shares to buy or sell. Shares of NextShares funds are normally bought and sold in the secondary market through a broker, and may not be individually purchased or redeemed from the fund. In the secondary market, buyers and sellers transact with each other, rather than with the fund. NextShares funds issue and redeem shares only in specified creation unit quantities in transactions by or through Authorized Participants. In such transactions, a fund issues and redeems shares in exchange for the basket of securities, other instruments and/or cash that the fund specifies each business day. By transacting in kind, a NextShares fund can lower its trading costs and enhance fund tax efficiency by avoiding forced sales of securities to meet redemptions. Redemptions may be effected partially or entirely in cash when in-kind delivery is not practicable or deemed not in the best interests of shareholders. A fund’s basket is not intended to be representative of the fund’s current portfolio positions and may vary significantly from current positions. As exchange-traded securities, NextShares can operate with low transfer agency expenses by utilizing the same highly efficient share processing system as used for exchange-listed stocks and ETFs. Before investing in NextShares, investors should consider carefully its investment objectives, risks, charges and expenses. This and other important information is contained in the prospectus and summary prospectus, which can be obtained from a financial advisor. Prospective investors should read the prospectus carefully before investing.